I've been busy preparing for an event next weekend, but I did manage to make a test batch of Chocolate Chip Cookie Dough Soap Cupcakes tonight! The frosting will turn a milk chocolate color, and the little cookies are also soap. These cupcakes adorable! I'd like to make you one of TheSage's soap sages! Hi Andee, thanks so much for the nice compliment! That sounds like fun...what does a soap sage do?! This is really great, the cupcakes are so adorable! It looks so easy when I watch how you make cupcakes, but I bet is not easy at all!It is really good idea to have support from the kids. My daughter also helped me last week by taking of photos while I made one batch of soap. It was grate fun! They are truly beautiful,Cee! Like those roses,everything look easy when you do. I also want to make cupcakes,but I'm a bit scared of wasting precious material! Thanks so much Maja! The cupcakes are very fun to make, you should jump in and try it...I can't stop making them now! Marika,I've read that soaps must not even smell like food!! Correct? What a nonsense,I don't see the point of those narrow-minded people! As if they didn't have more serious issues to deal with! Oh, that would make me cry! I'd have nothing to make if I couldn't make soap that looked and smelled like food! Marika - the color has already changed to a cookie-dough color, and I'll try to post a picture in several days, once the color has completely changed! 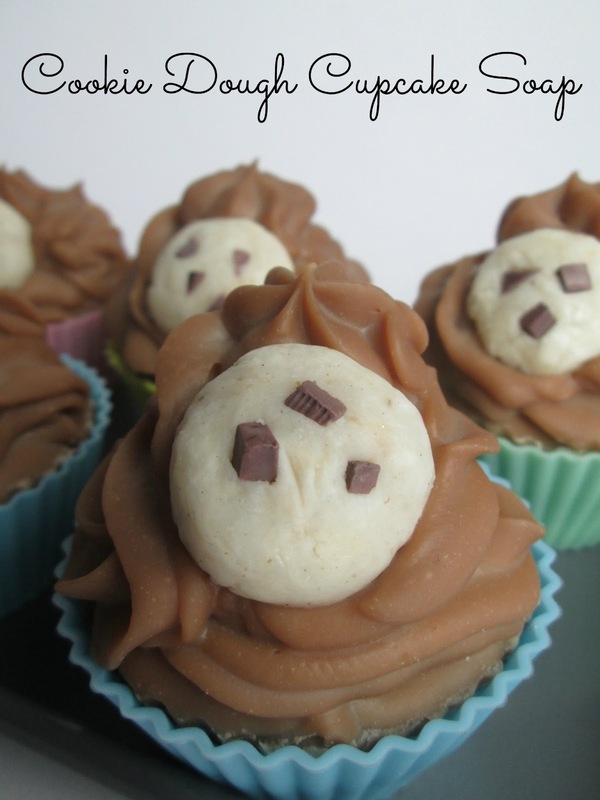 Those look delicious :) What a good idea for a soap cupcake! Thanks Chrissy! I keep expecting to find teeth marks in them, but so far so good...lol! Those little chocolate chip cookies are so dang cute! The cupcakes are going to look so yummy when they turn chocolate colored...and your daughter did a fantastic job with the video! These cookie cupcakes look so creamy and good. As always your attention to detail and sculpting cookies out of soap is very impressive. I adore your work, such an inspiration. 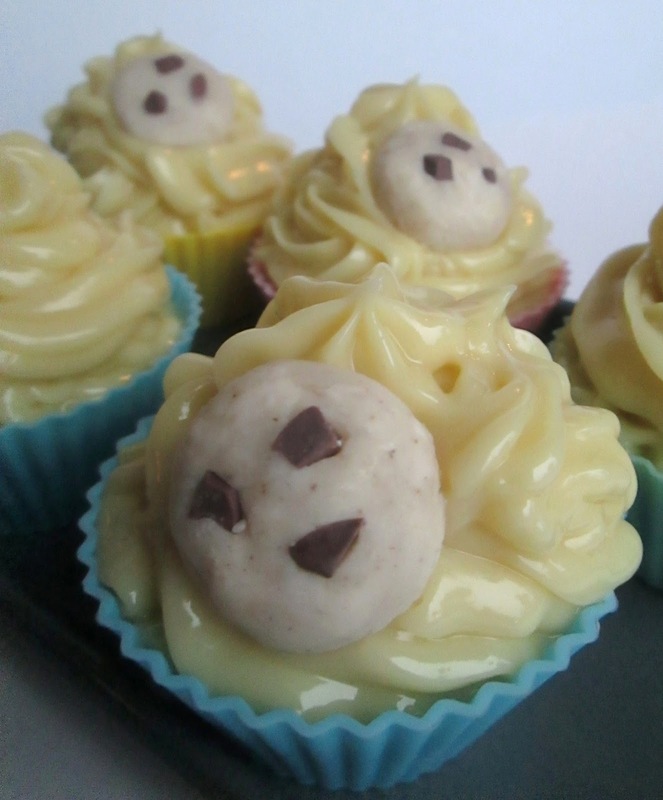 Thanks Anne-Marie, I'm having a lot of fun making soap cupcakes right now...all the cuteness but no calories...lol! Those soaps are so adorable! I love the cookie embellishment, it's just a cute addition. I would be really hard pressed not to take a bite. These cupcakes are adorable, Cee! So sweet having your daughter helping you! These are so cute, Cee Gee, especially with the little cookies embedded in the frosting! It's great that your daughter gets involved in the soapmaking fun, too.